With its shiny, leathery, nearly evergreen leaves, this low-growing perennial is an excellent front-of-the-border plant when used in clusters. Its tiny but showy pink blooms borne on erect stems nestled in the foliage provide spring interest, while the foliage often flushes with red or bronze for fall and winter interest. Tolerates full sun if soil is kept moist. Prefers rich, moist but well-drained soil. Tolerates alkaline pH. Depends on variety. Species plants have rosy-pink blooms. Often tinted with red or bronze. In fall, becomes wholly red or bronze, lasting through the winter. Propagate by division or separation - Divide in early spring every 3 to 5 years, especially when the plant centers become sparse. Root rhizome sections with one or more leaf rosettes after flowering. Seed harvested from gardens usually does not breed true. Evergreen, so do not remove foliage in fall. Remove dead leaves in srping. Deadhead by cutting faded flower stalks to the ground. Remove dried out leaves during summer. If rhizomes push above soil surface, cover with soil or compost. Keep soil moist during dry spells for best performance. Divide every 3 to 5 years, or when center of clump dies out. �Baby Doll� grows 1 foot tall with medium green leaves flushed with bronze and pale pink blooms in mid to late spring. �Ballawley� grows 2 feet tall with medium green leaves and red blooms on red flower stems in mid- to late spring. Leaves turn purple with bronze tinting in the winter. �Beethoven� grows 1 to 1.5 feet tall with medium green leaves and white blooms with red to pink calyxes in mid- to late spring. �Bell Tower� grows 1 to 1.5 feet tall with dark rosy pink blooms in mid- to late spring. Medium green leaves. �Bressingham Bountiful� grows 1 to 1.5 feet tall with dark green, thin leaves margined in dark red. Produces pendulous rosy pink blooms in mid- to late spring. Susceptible to frost damage. �Bressingham Ruby� grows 1 foot tall with dark green leaves with red flushed undersides. In mid- to late spring, produces pendulous red blooms. Foliage becomes bright red in winter. �Bressingham Salmon� grows 1 to 1.5 feet tall with dark green leaves flushed with bronze. Blooms are vivid salmon and borne in mid- to late spring. Winter foliage is dark red. �Bressingham White� grows 1 to 1.5 feet tall with numerous pure white blooms over dark green foliage in mid- to late spring. �Eric Smith� grows 1 to 1.5 feet tall with medium-green leaves tinted with bronze and dark coral blooms in mid- to late spring. Winter foliage is reddish bronze. �Evening Glow� (�Abendglut�) grows 1 foot tall with red flushed, red undersided dark green leaves. Produces semi-double reddish-magenta blooms on red stems in mid- to late spring. �Morning Red� (�Morgenr�te�) grows 1 to 1.5 feet tall with dark green leaves and rosy red blooms on red stems in mid- to late spring. �Opal� grows 1 foot tall with red stems and medium-green leaves. 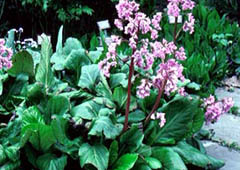 Produces violet-pink blooms from early to late spring. �Pinneberg� grows 1 foot tall with bright red blooms in spring. Medium green leaves are vivid red in the fall. 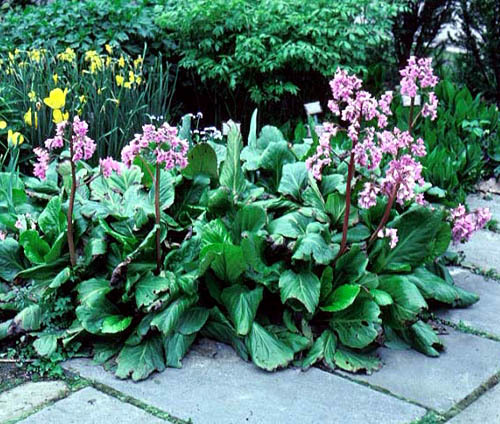 �Pugsley�s Pink� grows 1 to 1.5 feet tall with medium-green leaves, the undersides flushed red, and pink blooms in mid- to late spring. �Purple King� (�Purpurk�nigin�) grows 1 to 1.5 feet tall with medium-green leaves and rosy blooms with salmon tinting from early to late spring. �Snow Queen� (�Schneek�nigin�) grows 1 to 1.5 feet tall with medium-green leaves with curled margins. Bears pale pink blooms that deepen in color with age in early to midspring. �Sunningdale� grows 1 to 1.5 feet tall with scallop-edged, dark green leaves flushed red on the undersides. Produces violet magenta blooms in early to midspring. Foliage is reddish-bronze in winter. �Winter Fairy Tale� (�Winterm�rchen�) grows 1 to 1.5 feet tall with twisted, medium green leaves with reddish-purple undersides and rosy red blooms in early to midspring. Winter leaves are flushed with red.